Question: Can you discuss some of your Alabama DUI case wins? Answer: At Polson & Polson, we handle hundreds and hundreds of DUI cases every year. Some of the case wins that I can highlight just as a sampling are, recently we had a client that blew a .25 breath test after being stopped on the interstate for recklessly driving. When he was taken to the station and administered the breath test, the officer left the room and we were able, through our discovery process, to prove that one of the administrative protocols was breached and therefore we filed a motion to suppress and the breath test was thrown out of evidence. By the way that particular client was charged under what we call the A1 Subsection of the DUI statute, which really means his prosecution was solely based on what his breath result was, we were able to have this case dismissed. So even on the front end, it looked like a very severe case with the high breath. Because of our defense, he was able to be found not guilty. Another example is, we recently had an Alabama state trooper stop one of our clients for going 98 miles an hour on the interstate. He was given field sobriety tests, which the officer or the trooper opined that he failed, and then was taken to the jail where he blew a .14 on his breath test. After a jury trial, he was found not guilty of DUI. As well, we recently had a professional with a professional license at stake charged with three counts of felony vehicular assault and one count of felony leaving the scene of the accident. After a lengthy period of litigation, we were able to have all felony counts dismissed, no jail time, and the person was able to save the professional license. 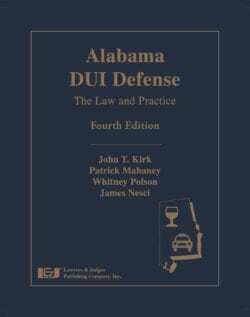 Question: Are there sentence enhancements for DUI in Alabama? 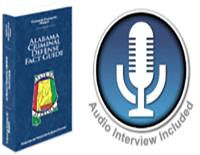 Answer: In Alabama, there are several ways that your sentence could be enhanced if convicted of DUI. Over recent years, the legislature has passed many different “get tough” penalties and laws in terms of DUI cases. These deal with recidivism issues and aggravating factors. Any prior conviction within a five-year period will increase your sentence under the Alabama DUI laws. A second conviction within a five-year period requires a minimum mandatory five days in jail, higher fines of up to $5,100 and a one-year drivers license revocation. As well, you would have to install an ignition interlock device on your vehicle. A third DUI within a five-year period creates a minimum mandatory 60-day jail sentence and up to a $10,100 fine, a three-year drivers license revocation and a mandatory ignition interlock device. A fourth or subsequent DUI within a five-year period is a felony that requires a year and a day sentence with a minimum 10 days to serve and up to a $10,100 fine, plus five years of drivers license revocation and a mandatory ignition interlock device. Another aggravating factor or sentence enhancement in Alabama is if your breath test result is a .15 or greater, even on a first offense, this creates a mandatory ignition interlock device being installed on your vehicle and double the minimum penalty being posed against you. An additional enhancement in the DUI statute of Alabama is if there was a child under the age of 14 in the vehicle at the time of the stop. If this happens, you have to install an ignition interlock device in your vehicle. As well, if there is any injury involved, an ignition interlock device is required. If there is any serious injury from an accident, you could be charged with a felony assault. And if a death is involved, you could face a murder or a vehicular homicide prosecution. Question: Will body cameras on police officers impact the way that DUI investigations are conducted in Alabama? Answer: Body cameras on police officers in DUI investigations will bring a lot of objectivity to the prosecution. If the video shows high levels of intoxication or a horrible performance on a field sobriety test, it’s something for the attorney and client to consider attempting to settle the case rather than if the body camera shows no signs of intoxication and positive performance on field sobriety test and/or inaccurately administered field sobriety test, it should be fertile ground to defend the case on. And so having a body camera, in my opinion, will be a positive thing in helping resolve the case one way or the other. Question: Why would an innocent person plead guilty to DUI in Alabama? Answer: Unfortunately, many people believe that just because they’re accused of a crime means they’re guilty of a crime. However, the system that we have set up in our state and in our country presumes folks to be innocent upon being charged. Without proper representation, without proper knowledge, folks think their only option is to plead guilty when they walk into a court. Unfortunately, the courts are not set up in a way to advise folks of many of the rights that they have, and therefore it’s very, very important for someone accused of a DUI to consult with a DUI defense lawyer to learn of the possible defenses and rights that they have in defending their case. Question: Is it possible for a person’s driving ability to be impaired by nervousness over being followed and then pulled over by the police in Alabama? Answer: Yes. There are studies that show that the body’s reaction to stress can mimic signs of intoxication. Therefore, it’s very important to objectively justify the officer’s probable cause determination and to challenge any indicia of intoxication in court. Question: What are some of the driving behaviors that police officers look for in identifying suspected drunk drivers in Alabama? Answer: In the police officer’s training for DUI detection, they learn from NHTSA—the National Highway Traffic Safety Administration—20 different visual clues to suspect somebody of DUI while driving at night. Some of these include turning with a wide radius, straddling the lane divider, almost striking another car or object, weaving, driving on something other than the designated roadway, swerving, stopping for no cause or going under 10 miles per hour of the limit. As well, most DUI cases are begun from a simple traffic violation such as speeding, improper equipment violations, failing to stop at a stop sign. Question:Can the signs of intoxication that police look for when conducting an Alabama DUI investigation really be caused by something else? Answer: Absolutely. There are numerous things that can mimic signs of intoxication, such as medical conditions, anxiety, physical limitations. Standardized field sobriety tests are used on the same standard for one of the top athletes as somebody that’s a couch potato. Question: What are some of the clues that police are looking for when they begin to investigate a suspected drunk driver in Alabama? Answer:Police are trained to have three different phases of DUI detection. Number one is called the vehicle in motion, which would include things such as traffic infractions, unusual driving actions and the stopping sequence of the suspected drunk driver. The second stage is what we call personal contact, which is typically at the window of the vehicle where the officer is looking for certain things from his sight, hearing certain things, smelling things; the condition of the person, the smell of alcohol or drugs, slurred speech, bloodshot eyes. And then they give divided attention tasks, such as asking the driver to provide multiple documents at the same time. Third phase is what we call pre-arrest screening, which includes field sobriety testing. Question: How do I pay for a DUI attorney to represent me in Alabama? Is all of the money due up front? Answer: At Polson & Polson, we offer a complimentary case evaluation to determine the best game plan necessary to favorably and aggressively defend your case. After that consultation, we will be able to assess what type of fee we will charge and then at that point offer different payment options. We take cash, check, major credit cards and allow flexible payment plans over time. We do not require all of the money up front; however, typically the balance of fee is due before we go to court. All of these arrangements can be made at the consultation. Question: Will a DUI in Alabama cause me to lose my job? Answer: In Alabama, a DUI conviction could be a basis to affect your job or to lose your job. However, just being accused of a DUI does not mean a conviction. So it’s very, very important to contest the charge, stand on your presumption of innocence and aggressively defend the charge in court, because if convicted it could potentially affect your license, your employment, your insurance.